Also serving communities of Brookfield, North Riverside, La Grange. There are 36 Assisted Living Facilities in the La Grange Park area, with 3 in La Grange Park and 33 nearby. To help you with your search, browse the 300 reviews below for assisted living facilities in La Grange Park. On average, consumers rate assisted living in La Grange Park 3.9 out of 5 stars. Better rated regions include Hinsdale with an average rating of 5.0 out of 5 stars. Caring.com has helped thousands of families find high-quality senior care. To speak with one of our Family Advisors about assisted living options and costs in La Grange Park, call (855) 863-8283. La Grange Park is a suburb of Chicago and is located along the banks of Lake Michigan. In 2012, the Chicago area was named one of the AARP's 10 Great Cities to Retire. At 18.1 percent, there's a large concentration of residents over the age of 65 years in La Grange Park. While there are only three assisted living establishments in La Grange Park, another 55 are located very close by in surrounding areas such as Chicago, Oak Park and Westmont. The Illinois Department of Public Health is responsible for licensing and regulating assisted living establishments throughout the state. La Grange Park has an array of community services for seniors, including West Suburban Senior Services, a program that offers seniors the chance to participate in seminars, activities, parties and outings. It also has more than 15 senior centers. Seniors can feel extremely safe living in La Grange Park. The village is safer than 76 percent of U.S. cities and only 0.22 violent crimes occur per 1,000 residents. By comparison, the state average is 4.36 violent crimes per 1,000 residents. Seniors on a budget may want to look for assisted living options elsewhere. The overall cost of living in La Grange Park is 29.1 percent higher than the U.S. average. All social security, pension and retirement savings income are tax-exempt in Illinois. Seniors residing in La Grange Park can use these savings to help pay for the cost of assisted living. The La Grange Park area is home to world-class medical facilities, including AMITA Health Adventist Medical Center La Grange, in case of medical emergencies or illness. La Grange Park has two options for safe public transportation, MetraRail and Pace, both of which offer reduced fares for seniors. Assisted Living costs in La Grange Park start around $0 per month on average, while the nationwide average cost of assisted living is $4,000 per month, according to the latest figures from Genworth’s Cost of Care Survey. It’s important to note that assisted living rates in La Grange Park and the surrounding suburbs can vary widely based on factors such as location, the level of care needed, apartment size and the types of amenities offered at each community. 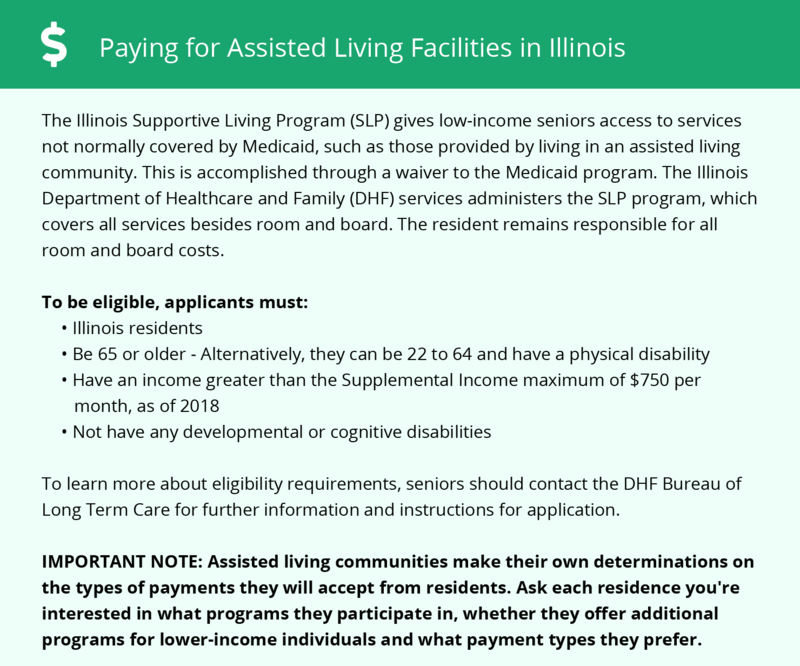 There are no Medicaid programs available to residents of assisted living establishments in Illinois that help pay for the cost of services. There is an Optional State Supplement available to residents who receive Supplemental Security Income that can be used to help pay for room and board costs. Family supplementation is also permitted. La Grange Park and the surrounding area are home to numerous government agencies and non-profit organizations offering help for seniors searching for or currently residing in an assisted living community. These organizations can also provide assistance in a number of other eldercare services such as geriatric care management, elder law advice, estate planning, finding home care and health and wellness programs. To see a list of free assisted living resources in La Grange Park, please visit our Assisted Living in Illinois page. La Grange Park-area assisted living communities must adhere to the comprehensive set of state laws and regulations that all assisted living communities in Illinois are required to follow. Visit our Assisted Living in Illinois page for more information about these laws.